Have you always wanted to stay at a typical Vendée house? You're in luck! 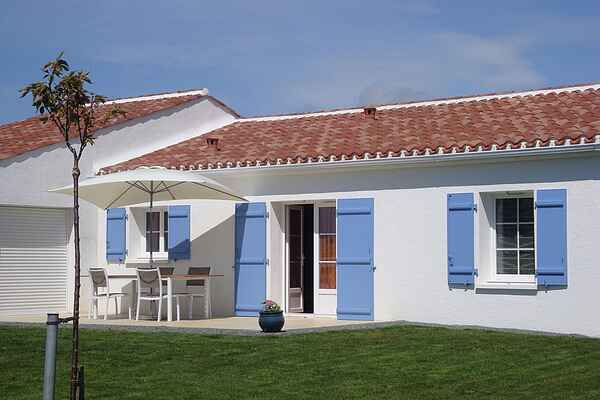 That white vacation home with the blue shutters is situated near the beautiful, wide sandy beaches that the Vendée is so famous for. The house is all on one level and has a modern interior. Take a stroll through the large, enclosed garden to the south. There is plenty of room for the kids to run around the yard, to play soccer or badminton. After a wonderful day at the beach or an excursion, you can enjoy a cozy culinary experience around the barbecue in the evening. In short: a nice home for your vacation! The house is situated in a quiet area in the town of Avrillé and you're 10 minutes away from the beach in Longville-sur-Mer (8 km). The medieval town of Talmont.St. Hilaire (14 km) is worth a visit. It houses a car museum and the Château de Talmont, where the English King Richard the Lionheart once resided. You can also take fun day trips to Les Sables d'Olonne (22 km). This is a lively port and seaside resort, and also the main town on the 'Light Coast' (as this coastal region is also called). A little further drive is the medieval fortress town of La Rochelle (75 km).